Kurt Snibbe/ESPN.com Has anyone ever seen Jay Cutler and Jeff George in the same room? After the 2008 season, when Jay Cutler and the Broncos became just the third team in NFL history to blow a three-game lead in the division and miss the playoffs, the former Broncos QB who always seemed to do more with less (he was 40-18 as a starter in Denver) said the physically gifted Cutler (17-20 with the Broncos) was "a helluva player." "But," Plummer added, "Jeff George was a helluva player." 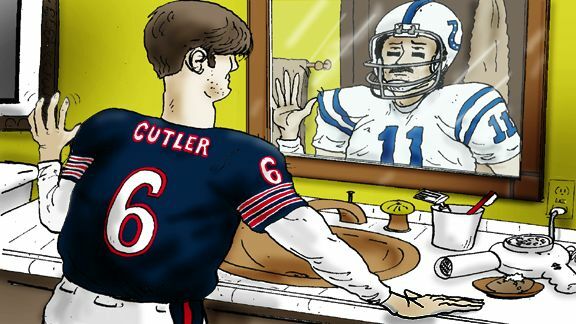 I picked up on that statement, and in ESPN The Magazine's 2009 NFL preview mentioned the uncanny comparisons between Cutler and George: two can't-miss, Hoosier-born QBs with golden arms and rotten 'tudes. Then, in December, former Ravens coach Brian Billick mentioned that Cutler, who led the league in picks, was starting to feel a little "Jeff George-ish." Pretty soon everyone was wondering if Jay Cutler was indeed the reincarnation of Jeff George, the No. 1 pick overall in 1990 whose attitude and leadership led him to three winning seasons in 12 years with five different teams. The Cutler-George comparisons had just started going away until last week, when Cutler single-handedly blew a game against the Redskins with four horrid interceptions (all to DeAngelo Hall) and a goal-line fumble. It was the 17th time he's thrown multiple picks in a game in 60 career starts. As if that wasn't bad enough, before the Hall of Fame could even ask for Hall's jersey, Cutler was at the postgame podium in his perma-smirk, spewing what has to be the most asinine, delusional, out-of-touch and arrogant quote of the year. "There's no reason to shy away from Hall," said Cutler. "I mean, that's hard for me to say, throwing four picks at a guy, but I'd still, if we had to play them tomorrow, I'd go at him every time, if we could." The Washington Post compared Cutler's statement to Napoleon saying he'd invade Russia in the winter every time, if he could. And so, that night, the comparisons started up again. On ESPN's Sunday Night Countdown, Cris Carter said: "Great talent in Cutler, but what I'm seeing is the same thing I saw in another great talent, talent undeveloped and the perfect storm. Cutler and Mike Martz equals a guy, Jeff George: Great talent, undeveloped." So I decided to dig a little deeper and work up a side-by-side comparison between Jay Cutler and Jeff George. And what I found is frightening. Creepy even. In fact, I think we can all stop arguing about the Jay Cutler-Jeff George connection and, instead, start investigating why no one has ever seen these two in the same room together. OUCH "[Jay Cutler] and Tony Gonzalez are the biggest crybabies in the league." -- linebacker Matt Wilhelm "The bottom line is, I did not think the Washington Redskins could win with Jeff George as our quarterback." MOST DELUSIONAL STATEMENT After throwing four easy interceptions to Redskins DeAngelo Hall, Cutler says "If we had to play them tomorrow, I'd go at him every time, if we could." In 2004, gets tryout with 6-10 Lions, who pass on George. Four years later, George says he looks around the NFL and he wants to "scream at the people in charge, 'What are you thinking?'" George, who had three winning records in 12 seasons with five different teams, also insists he'd have a Super Bowl ring if he was still playing for the Vikings. SAD ENDING SCENARIO Continues with the horrid interceptions, sacks and milquetoast leadership; Bears fail to take advantage of a down year in the injury-ravaged NFC North, Lovie Smith gets fired; next coaching staff isn't afraid to actually stand up to Cutler, he gets sent packing, and people start writing "journeyman" next to his name, the first step toward ending up like ... ... Out of the league for nine years but, at 42, still humiliating himself by publicly begging for another chance, probably because he realized (far too late) that he squandered his rare talents. Editor's note: Looking for Flem's top five, his music riffs and weekly reader e-mail WHYLO (who helped you log on?) awards? Check 'em out on Facebook and Twitter at @daveflemingespn. Also, coming Friday a sampling of the voluminous reader response to the Flem File's Requiem for the Golden Boy.